The one problem with having my bathroom and closet upstairs with my studio is this: I go up to take a shower and get ready to go out, but then I get distracted. I see a piece of fabric I need to use - or there's just one more step I want to do on a current project - or there's one spool of thread I need to put away - and then there's a photo I've clipped for inspiration - and then there's a piece of fabric I need to put away - but then I find another piece of fabric I want to use - and then John's asking if I'm ready to go. And I'm all like "What?? Go where?" Then I'll take a shower, but before I dry my hair I think, "Maybe I'll just put the binding on" and start to sew. You get the point. This bag on the left really is the final project of 2010. I love it. Even though I don't necessarily plan on taking my iPad anywhere, it's still a convenient way to keep the iPad and its cords together in one spot. While I was sewing today, John began to dismantle the Christmas decorations and did take down the Christmas wall hanging. Here's Moonscapes doing what I intended: making the new living room chair upholstery look like it belongs in the living room! Ok, this time I'm really going up to shower and get ready to go out. We're heading to Greek Islands in Lombard with the Hickses and the Seidelmans. Nice! The difference in size is these two bags isn't huge, but I think it's enough to make a difference. The green bag started as a 21.5" square. This second bag was a 24" quilted square. Here's what the bag is designed to carry. I had intended this day as a studio clean up, but sewing has taken precedence. I have another iPad bag ready for the little bit of handwork and then the velcro and the magnets. So this year will end - happily - with the studio still a mess and thinking about posting process pictures of this envelope bag. 2010 comes to a peaceful and happy ending. And that's my wish for you and me in 2011 - peace and happiness. It's completed and ready to hang in the living room, as soon as John takes the quilted Christmas tree down. I'll be happy to look at this daily, but of course I would do things differently if I were starting this project all over - a common lament among quilters. I do love the colors and fabrics in this piece, and the inspiration behind this design was to unify the various colors currently in my living room. I'm also happy that I am finally getting the hang of free-motion quilting - this piece represents my first with free-motion quilting. I like that I used one color of thread which takes on a new dimension with each moon But instead of framing the quilt with a traditional border (which I did deliberately to incorporate that scarlet red), I wish that I had engaged the edges of the quilt with the design. I wish that I was bolder with my quilting, but that's a skill that will grow with time. And - bottom line? - this quilt makes me happy. Christmas Eve with the kids and grandkids in LaGrange Park and then Christmas Day here with my sister, her family, and our parents were both terrific. John and I are so blessed with our families. Today was a day to enjoy leftovers and to not get dressed - a luxury. While John was footballing (Go Bears! ), I made a quilted cover for my new iPad - a slightly bigger version of the envelope purse - and decided I would be very happy if I could begin free-motion quilting Moonscapes, which I started last September. So I got busy, using words from Hecate in Macbeth (be bloody, bold, and resolute) to spur me on. Out of the 25 moons, I have quilted 7 of them. I'm not sure I like the effect - yet. This piece is an exercise in relativity. I'm using the same color thread for all the moon quilting, which is more pronounced on some of the the moon and their backgrounds. These pillows for John's sister Chris are finished. These are both 24" by 24" and will be part of the window seat in her dining room. Chris uses color the way I use black t-shirts. So it's always fun to work on something for her because her color sense is so different from mine. This iron is a Christmas gift for the studio, and I am pretty excited about this. It's the Rowenta Steamium and kind of futuristic-looking, isn't it? I've had two other Rowenta's, each lasting for over 10 years. Considering that an iron is something I use as often as and in conjunction with my sewing machines, I'm happy with their lifespans. The heat control of this older iron has come off - broken plastic parts - so that this iron now has one temperature: HOT! Also check out the number of steam holes on this new iron. There's supposed to be 400! In the true spirit of the season, I won't use my new iron until December 26! My shopping - such as it is - is complete. My wrapping becomes what I've made, despite John's ability to wrap presents so nicely. These are pillows I'm making for John's sister Chris and hope to give to her Christmas Eve. I have the 24" by 24" pillow forms. All I need to do is finish them! But kitchen responsibilities are calling - steamed cranberry pudding and hard sauce, mushroom barley soup, slicing the beef for stroganoff. And I'm having an attack of the lazies - this just might be a "blow off the workout and watch a movie" afternoon. Today's a day to enjoy the peace of the Christmas season, despite John's having decorated my quilted Christmas tree. At least he didn't string it with lights! Maybe there are enough hours in the day. It's my choice to take a break from the studio! Peace to all during these dark days of the Winter Solstice. 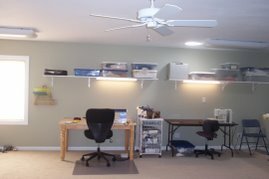 Being organized? It's important. In fact, it's huge. This morning the mom of a high school senior came over with various hockey jerseys and t-shirts from her son. We figured out that we will use a total of 30 jerseys/shirts, and that at least one of the rows will have to be taller than the rest because some of these jerseys won't fit the 12.5" by 12.5" template. Three of these shirts are spacers with the real ones to be delivered in March. Perhaps by then we'll know what college this young man will attend and incorporate those school colors into the quilt. And we also know this quilt will be used as a bed quilt. For the time being, I'm just going to pick all these up and start a new pile in the studio. At some point I'll cut them and work on a preliminary layout. Nice to see the project list for 2011 take shape! David graduated from York High School recently, and his mom is immensely proud of her son's involvement in Track and Field during these high school years. So often these memory quilts are for the graduate, but not this one. This surprise quilt is for David's mom from one of her aunts. What a great Christmas gift!. And what a great Christmas surprise for me - I got it done. Thought I had until Saturday, but had to get it done for tomorrow. While it is complete, I didn't photograph it properly, hence the two detail shots which follow this big picture. It's sitting inside my 60" by 80" tape outline, and is 86" x 50". There's a little sleeve on the top back so that David's mom can hang this. Merry Christmas! I know I'm productive and my secret is my husband. He pretty much does it all. Occasionally I'll cook, but more often than not he does dinners. And shopping. And laundry. And Christmas cards. And the Christmas Tree. I could go on...The two bags on the left are from an Internet purchase. I thought the pattern looked like wood, but as you can see it's really a series of rulers and numbers. Tonight we're having dinner at the Hugheses, and Ron is a master carpenter. An appropriate "murse" for him, eh? Midge is getting the fabric and pattern for a Carolina Carry-all . The other MORS bag is from fabric that I think is beautiful and Christmassy, and I just wanted to make it. Last, a little envelope bag - not Christmassy but attractive. John's sister Chris ordered 6 envelope purses to give as Christmas presents. Luckily the weather this weekend cooperated and I was able to get all of them finished. There really is something to the saying "Practice makes perfect." The purse I like this most is this one because I was able to experiment around with some free-motion quilting. I have one more piece of this batik fabric, and I want to try kicking the quilting up a notch. The MORS bags are for my mom to give as Christmas presents. These Christmas fabrics all have gold in them and are pretty snazzy. One set of bags is smaller than the others - the piece of fabric I had wasn't quite enough for full-size bags. I'll get to the final Christmas commission - just not today! With some purses I know exactly what lining to use. The red paisley is perfect with the golden lining. But the other purse? I'm still not sure which fabric should be the outside. I finally went with my gut and made the Oriental black/grey/white the body of the purse. I can't wait to see what comes out of tomorrow's work in the studio! It used to be "Papers to Grade, Papers to Grade, I still have lots of papers to grade." Now it's "Purses and Bags, Purses and Bag, I get to make more Purses and Bags". I much prefer my current chant. While I do have one more commission with a Christmas deadline, that project is well under control. So it's time to play with purses and bags. These little envelope purses (pattern available at Jinny Beyer's website) begin with an 18" quilted square, which must also be bound. Each purse needs a strap that is 48" long before construction. A magnetic clasp and 2 velcro sets. So today was a trip to Joann's Fabrics, of course with coupon in hand. The girls there know me, and one of them was kind enough to point on magnetic clasps that were on sale. And the cording? One of these I found in the Home Dec part of the store. Here's one of the purses in construction. There's a sewing line drawn in with a chalk pencil, and tucked into this seam is the purse's strap. Then the 2 triangular corners turned inside out. One corner of this purse has been turned. A little bit of handwork, iron-on velcro, and some magnets finish the purse off. And of course there are always Mors bags. This is pretty fabric but waaaay too thick for piecing. But for a bag? Perfect. Purses and Bags. Purses and Bags. How blessed am I to be so happy making purses and bags. This Christmas Christopher LeGrand will be making the drive to his family home in Missouri by himself. Normally, his brother Bradley would go with him. But Bradley passed away August 30. Because Chris lives in the Chicago area where Bradley lived, Chris has had to deal with many of the details of Bradley's death. As painful as attending to all these details has been, this means that Chris has had a headstart with his grief. This first Christmas without Bradley is going to be difficult. Grief will be strong, and emotions will be on display. These quilts and pillow made from Bradley's clothing commissioned by Christopher will be a part of the family's Christmas celebration. This quilt is for Bradley's mom, Mary Francis. Notice the pockets in the upper right corner - there are three of them. In the center of the quilt there's lovely Fleur de Lis button that was at the neck of one of the shirts. Bradley's sister Linda is getting this quilt. While similar to the one above, it is overall a bit lighter. It does have that same fancy button right in the middle block. Both quilts were quilted in a similar fashion, creating an almost plaid effect on the back. While we all know these quilts were made from Bradley's shirts, Chris wanted words on the back of the quilt. I'm sorry my date stamp interferes. They simply say "Always with you. Bradley C. LeGrand." This pillow is for Bradley's Aunt Jane. They shared a special bond, including one involving the grief over the loss of their life partners. 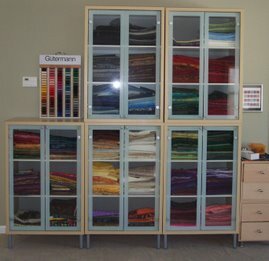 It is made from all the cuffs of the shirts used in the above quilts. Christopher may have a head start on his grief by organizing this project from Bradley's clothing, but his pain is just as acute as everyone else's in the LeGrand family. However, he has identified an important path for his and his family's grief. They will mourn Bradley's death. And then they can begin to celebrate his life. I know. People don't think quilting is dangerous. But it is. 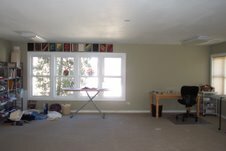 See Quilt Adventures - The Dangers, a post from last June. Bradley's mother's quilt is finished, and I only had to stop for bandaids 3 times. The quilt for Linda, Bradley's sister, has been pin-basted. So now I can do my favorite part of quilting - the actual quilting by sewing all three layers of the quilt together. I love this part because with every row of quilting, the pins come out. And as the pins come out, the quilt and the texture take shape. Christopher is coming over Sunday morning to pick up these Christmas presents for his family. I'll do some official photographs of these projects and one final blog entry before saying farewell to Bradley, who has been looking over my shoulder this whole time, especially when I was cutting up his underwear. 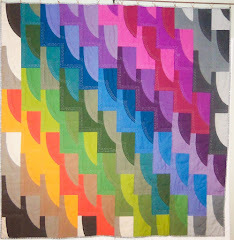 Doesn't that make you want to examine the quilts to see if you can spot those blocks?! December 1. Snow. Right on schedule. Ok, really - does this count as snow? I tried to capture the big fluffy flakes, but they were melting too quickly. So, no. This wasn't really snow. Still, it's exciting to see the first "snowfall" of the seaon. I love being in my studio and able to watch the weather. In fact I often have to lower the shade so that I can concentrate on my quilting. I'm running rows of quilting .5" on either side of the seams and also right down the middle of each row and column of blocks. Bradley's mother's quilt is almost completed, and then I can pin-baste and quilt Linda's.